In addition to being the terminal degradative compartment of the cell’s endocytic and autophagic pathways, the lysosome is a multifunctional signalling hub integrating the cell’s response to nutrient status and growth factor/hormone signalling. 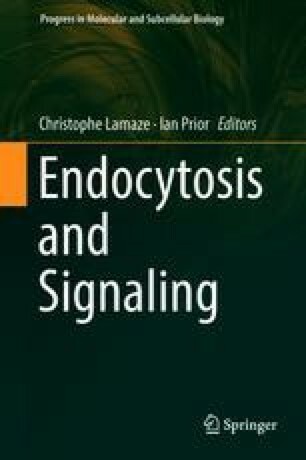 The cytosolic surface of the limiting membrane of the lysosome is the site of activation of the multiprotein complex mammalian target of rapamycin complex 1 (mTORC1), which phosphorylates numerous cell growth-related substrates, including transcription factor EB (TFEB). Under conditions in which mTORC1 is inhibited including starvation, TFEB becomes dephosphorylated and translocates to the nucleus where it functions as a master regulator of lysosome biogenesis. The signalling role of lysosomes is not limited to this pathway. They act as an intracellular Ca2+ store, which can release Ca2+ into the cytosol for both local effects on membrane fusion and pleiotropic effects within the cell. The relationship and crosstalk between the lysosomal and endoplasmic reticulum (ER) Ca2+ stores play a role in shaping intracellular Ca2+ signalling. Lysosomes also perform other signalling functions, which are discussed. Current views of the lysosomal compartment recognize its dynamic nature. It includes endolysosomes, autolysosome and storage lysosomes that are constantly engaged in fusion/fission events and lysosome regeneration. How signalling is affected by individual lysosomal organelles being at different stages of these processes and/or at different sites within the cell is poorly understood, but is discussed. GGH is supported by a Basic Research Fellowship from Parkinson Canada. Recent experimental work from JPL and NAB referred to in this chapter is supported by UK MRC research grant MR/M010007/1. LJD is supported by a BBSRC industrial CASE studentship with GSK Research and Development Ltd. The Cambridge Institute for Medical Research is supported by Wellcome Trust Strategic Award 100140.